Good typography induces a good mood! Remove fills, gridlines, border and bolding. Le " -align text, right-align numbers and align headings with data. Put white space to work to group and separate. Use tabular lining numerals, consistent precision, and remove repetition. This is a story about someone who lived in Happyland. His name was Mr Happy and he was f a t and round, and happy. One day Mr Happy went for a walk in the woods. block Block rendering while downloading the webfont for up to three seconds. A " er three seconds the fallback font will be shown. If the webfont loads a " erwards, show the webfont. Richard Ru ! 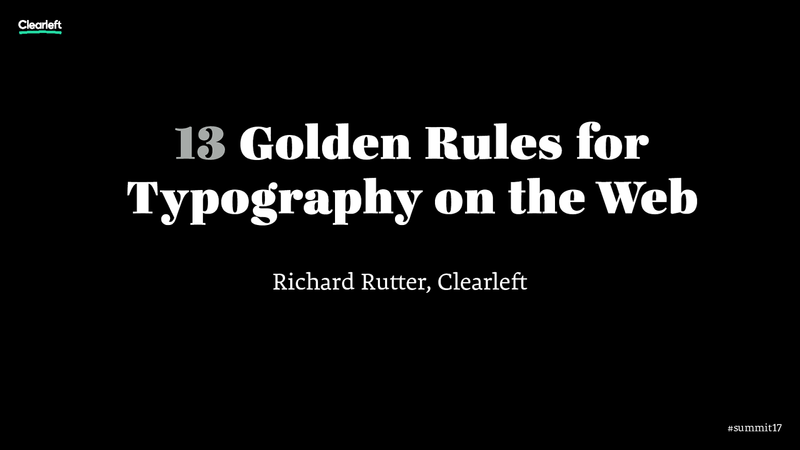 er, Clearle "
View 13 Golden Rules of Typography on the Web on Notist. Typography is what comes between the author and the reader. This is as true on the web as it is in any other medium. If a text has anything at all significant to say, it needs a typographer’s care, which will in turn be repaid by the reader’s attention. If you design websites or use CSS then you are a typographer whether you know it or not. This talk will give you will give a set of guidelines that deftly combine implement­ation details with typographic theory and set you on the road to designing beautiful and effective responsive typography. Richard puts presentations on for free. You can too. A handbook for designing beautiful and effective responsive typography. Loved @clagnut typography talk at #summit17 - so directly useful. Do buy his book, it's great.